Google Mail / Gmail was the first webmail service (online email provider) to offer "unlimited storage", or on demand ever-increasing disk space. By default, your Gmail account comes with over 7 Gb (gigabytes, equivalent to 7,000 megabytes) of email storage at your disposal. Most of us will never reach space requirements anywhere close to that number, but if you are heavily using email attachments, perhaps even sharing the same Gmail email account amongst several people collaborating on a given project, that upper limit may become an issue. If this is the case, you can request additional storage from Google for your Gmail account, as we'll explain how to do in this tutorial. Note that Gmail remains a free service, but you will need to pay to get more disk space, unless you use a third-party upload service to store email attachments (for example). Once you are inside your Gmail account, click on the "Settings" link displayed in the top right corner of the screen, to load your email account profile and options. Then, select the "Accounts and Imports" tab, third from the left. To get more disk space for your emails and file attachments, click on the "Upgrade your storage" link, and Gmail will open a new window (popup). 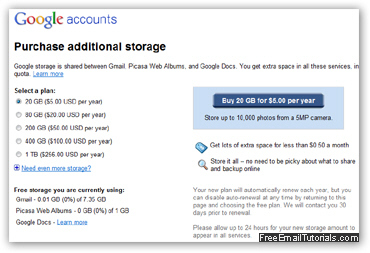 In the "Google Accounts" popup, you will see on the left several package options for additional disk space and storage; select the one you want on the left, and click on the "Buy X GB for $Y.00 per year": (details depend on your selection and currency). As is apparent from above, this is a recurring fee, billed yearly, and whose amount depends on (a) the amount of storage you needed, and (b) on Google's policies and free offerings as they pertain to their Google Mail / Gmail webmail service. Overall, these prices are very reasonable, and as we mentioned earlier, the free, base disk space offering will most likely be plenty for most of us. Also, keep in mind that you can always create another Gmail account and spread the load of your file storage needs across multiple email addresses, and/or use automatic email forwarding as appropriate.